Definition at line 48 of file llviewerjointattachment.h. Definition at line 56 of file llviewerjointattachment.cpp. References FALSE, LLJoint::mUpdateXform, and LLViewerJoint::mValid. Definition at line 72 of file llviewerjointattachment.cpp. Definition at line 172 of file llviewerjointattachment.cpp. References calcLOD(), FALSE, LLViewerObject::getNVPair(), LLNameValue::getString(), lldebugs, llendl, llwarns, mAttachedObject, mAttachmentDirty, LLViewerObject::mChildList, LLViewerObject::mDrawable, mIsHUDAttachment, mItemID, LLViewerObject::mText, LLJoint::mUpdateXform, LLPointer< Type >::notNull(), s, LLUUID::set(), setupDrawable(), and TRUE. Definition at line 349 of file llviewerjointattachment.cpp. References f, LLViewerObject::getMaxScale(), LLViewerObject::getMidScale(), llclamp(), llmax(), mAttachedObject, LLViewerObject::mChildList, and LLViewerJoint::setLOD(). Definition at line 333 of file llviewerjointattachment.cpp. References LLXform::getPosition(), llmin(), mAttachedObject, MAX_ATTACHMENT_DIST, LLVector3::normVec(), and LLViewerObject::setPosition(). Definition at line 87 of file llviewerjointattachment.cpp. References f, glBegin, glColor4f, glEnd, and LLVOAvatar::sShowAttachmentPoints. Definition at line 85 of file llviewerjointattachment.h. Definition at line 83 of file llviewerjointattachment.h. Definition at line 79 of file llviewerjointattachment.h. Referenced by LLPipeline::renderForSelect(), and LLViewerObjectList::renderObjectsForSelect(). Definition at line 88 of file llviewerjointattachment.h. Referenced by LLVOAvatar::attachObject(), and LLAgent::makeNewOutfit(). Definition at line 87 of file llviewerjointattachment.h. Definition at line 86 of file llviewerjointattachment.h. Referenced by handle_detach_from_avatar(), LLAgent::makeNewOutfit(), object_attached(), LLPipeline::renderForSelect(), LLViewerObjectList::renderObjectsForSelect(), rez_attachment(), and LLAgent::userRemoveAllAttachments(). Definition at line 84 of file llviewerjointattachment.h. Definition at line 74 of file llviewerjointattachment.h. Definition at line 81 of file llviewerjointattachment.h. Definition at line 79 of file llviewerjointattachment.cpp. Definition at line 108 of file llviewerjointattachment.cpp. References FALSE, mAttachedObject, mAttachmentDirty, LLViewerObject::mDrawable, and setupDrawable(). Definition at line 234 of file llviewerjointattachment.cpp. 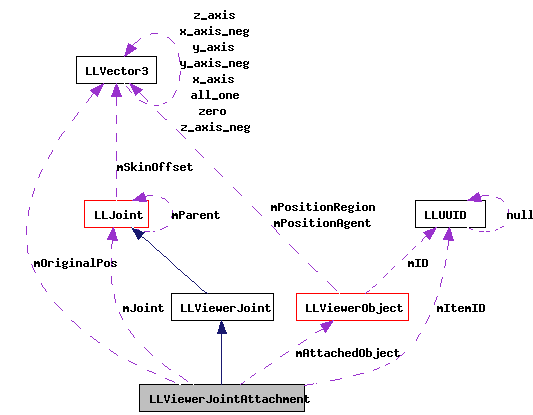 References FALSE, LLViewerObject::getRenderPosition(), LLViewerObject::getRenderRotation(), gPipeline, LLFace::HUD_RENDER, LLPipeline::markMoved(), LLPipeline::markTextured(), mAttachedObject, LLViewerObject::mChildList, LLViewerObject::mDrawable, mIsHUDAttachment, mItemID, LLViewerObject::mText, LLJoint::mUpdateXform, LLPointer< Type >::notNull(), NULL, S32, setAttachmentVisibility(), LLUUID::setNull(), TRUE, and LLDrawable::USE_BACKLIGHT. Definition at line 302 of file llviewerjointattachment.cpp. References LLViewerObject::isHUDAttachment(), LLPointer< Type >::isNull(), mAttachedObject, LLViewerObject::mDrawable, LLPipeline::RENDER_TYPE_HUD, and LLPipeline::RENDER_TYPE_VOLUME. Definition at line 75 of file llviewerjointattachment.h. Definition at line 78 of file llviewerjointattachment.h. Definition at line 71 of file llviewerjointattachment.h. Definition at line 324 of file llviewerjointattachment.cpp. Definition at line 72 of file llviewerjointattachment.h. 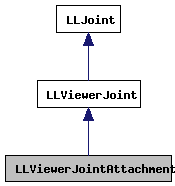 Definition at line 123 of file llviewerjointattachment.cpp. References LLDrawable::getFace(), LLDrawable::getNumFaces(), LLViewerObject::getRenderPosition(), LLViewerObject::getRenderRotation(), LLJoint::getWorldPosition(), LLJoint::getWorldRotation(), gPipeline, LLFace::HUD_RENDER, LLDrawable::makeActive(), LLPipeline::markMoved(), LLPipeline::markTextured(), mAttachedObject, LLViewerObject::mChildList, mIsHUDAttachment, LLJoint::mXform, LLDrawable::mXform, LLVector3::rotVec(), S32, LLXform::setParent(), LLXform::setPosition(), LLXform::setRotation(), LLFace::setState(), LLDrawable::setState(), and LLDrawable::USE_BACKLIGHT. Referenced by addObject(), and lazyAttach(). Definition at line 73 of file llviewerjointattachment.h. Definition at line 368 of file llviewerjointattachment.cpp. References FALSE, LLViewerJoint::mValid, LLViewerJoint::setValid(), and TRUE. Definition at line 106 of file llviewerjointattachment.h. Referenced by addObject(), calcLOD(), clampObjectPosition(), getAttachmentDirty(), getNumObjects(), getObject(), lazyAttach(), removeObject(), setAttachmentVisibility(), and setupDrawable(). Definition at line 107 of file llviewerjointattachment.h. Referenced by addObject(), getAttachmentDirty(), and lazyAttach(). Definition at line 110 of file llviewerjointattachment.h. Referenced by getGroup(), and setGroup(). Definition at line 111 of file llviewerjointattachment.h. Referenced by addObject(), getIsHUDAttachment(), removeObject(), setIsHUDAttachment(), and setupDrawable(). Definition at line 113 of file llviewerjointattachment.h. Referenced by addObject(), getItemID(), and removeObject(). Definition at line 104 of file llviewerjointattachment.h. Definition at line 109 of file llviewerjointattachment.h. Definition at line 112 of file llviewerjointattachment.h. Referenced by getPieSlice(), and setPieSlice(). Definition at line 108 of file llviewerjointattachment.h. Referenced by getVisibleInFirstPerson(), and setVisibleInFirstPerson().